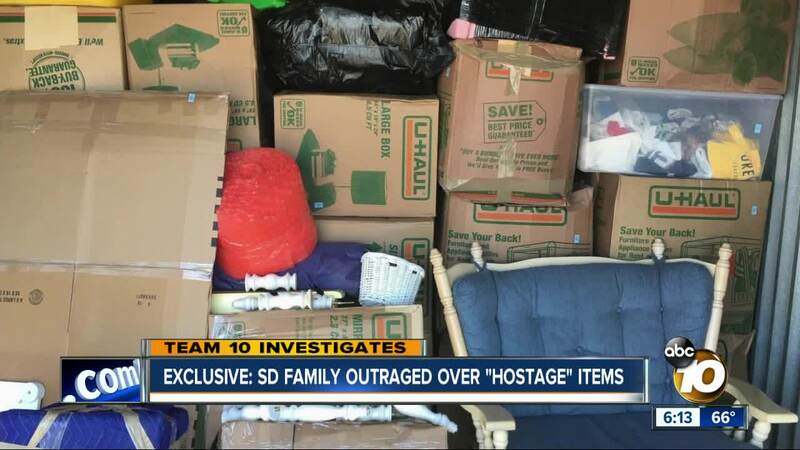 SAN DIEGO (KGTV) — A San Diego family is living in an empty home and says nearly everything they own is being held hostage by a moving company. They’re part of a growing group of people around the country who say they’re victims of a deceptive bait-and-switch operation. 10News has spoken to a representative of the moving company who denies wrongdoing. Over FaceTime, Brad and Vanessa Angle gave 10News a tour of their house in North Carolina. They recently moved there from their home in Poway. The family is sleeping on mattresses on the floor since their furniture and household items never arrived. The goal of relocating was to live a stress-free life, but the feeling of emptiness is driving them to tears. “It affects a lot it. It affects my daily life. I have to keep going, you know. I try to stand up every day for my kids. I have three kids that I have to be there for,” Vanessa said. What hurts the most is losing the memories. Her husband, Brad, says Titan Moving and Storage has the family’s irreplaceable belongings, like the photos and videos of their kids, and Vanessa’s wedding dress. On Titan Moving and Storage’s paperwork to the Angle family, it shows the company’s address is in Chantilly, Va. The Angles say the company had originally given them a binding estimate of $6,300 with $2,205 down. Yet after movers loaded everything up during the family’s moving day in July, the Angles say the movers claimed that the family had more items than what they were originally quoted for. The movers doubled the estimate. The Angles say the movers demanded a partial payment. “I think it was $6,700-something dollars that we had to write a check for,” says Brad. He says his family was assured that any issues could be worked out with a company associate come Monday. Monday came and went. “[An associate] answered the phone on my first call and then immediately hung up and then wouldn't answer after that,” says Brad of his attempt to resolve the dispute with the company. The Angles stopped payment on the check and the situation went from bad to worse. The Federal Motor Carrier Safety Administration, or FMCSA, is the government agency that oversees interstate moving trucks. The agency reports that the carrier has never been authorized to move household goods. The FMCSA is currently investigating the carrier. This year alone, the FMCSA reports there have been 98 complaints filed against the carrier. Complaints have come in from customers like Chris Baumann in Florida. He says the company pulled a bait-and-switch operation on him. “If I didn't have a headset on, you'd hear this house echoing. It's empty,” he said over video chat about not receiving his belongings from the moving company. He and others say they had checked reviews before hiring the company. Titan Moving and Storage only has one star on Yelp, but there are other companies listed on Yelp with similar names and better reviews, causing confusion for customers. The Angles recently got what they call "hostage” photos from the carrier. They were sent pictures of their items that are being held at an undisclosed storage facility in California. The company tells us it won’t release anything until receiving a storage payment from the family. “They're trying to charge us over a thousand dollars a month for storage which is insane,” says Brad. Titan Moving and Storage’s website has been down for several days. A manager with the company told us they're not taking new customers. He declined a taped interview but acknowledged that the company does not have a license to move household goods. He claimed it was due to a “filing issue” and said the company works with licensed third-party movers. The FMCSA tells 10News that the company is still not authorized to use third-party movers for household goods. The manager also told us that the company tried to resolve the matter with the Angles last month by offering them a reduced moving fee. The Angles call that a lie. “I see it as a crime. They don't have a license,” adds Vanessa. According to the FMCSA, the FMCSA does not have the authority to resolve claims against a moving company. State law enforcement, transportation and consumer affairs agencies are responsible for pursuing suspected incidents of moving fraud and regulating the operations of intrastate moves. According to the California Department of Consumer Affairs, moving companies that operate within California are required to be licensed by the Bureau of Electronic and Appliance Repair, Home Furnishings and Thermal Insulation (BEARHFTI), part of the Department of Consumer Affairs. The BEARHFTI became the new licensing and regulatory home for household movers on July 1, 2018. The BEARHFTI is aware of the consumer complaints against Titan Moving and Storage but cannot comment specifically during the open investigation. A spokesperson tells 10News that the company is not licensed with the BEARHFTI. A sergeant with the San Diego County Sheriff’s Department tells 10News that its detectives are looking into the matter.